A few weeks ago, I ventured into the world of making rye bread. I had been dying to make it for a least a year and finally had all of the ingredients I needed but somewhere I went wrong. The flavor of the bread was spot-on – perfect, actually – but something happened to the bread’s rise. It could have been that I refrigerated the dough overnight after the first proof period but I don’t really know for sure. So with family visiting over the weekend and a planned St. Patty’s Day meal on Saturday night, I made it my job to make a loaf of rye bread that was worthy of both the killer meal we were in for as well as worthy enough to be shared with you here. I pulled out my brandy-new copy of Baking Illustrated, cracked open the binding (don’t you love that sound of a new cookbook?! ), and found a recipe. My cousin was visiting again and after emptying boxes and cleaning the floors on Friday night, we quickly threw the recipe’s sponge together and then went the bed. If you’ve never made yeast recipe with a sponge step before, have no fear! 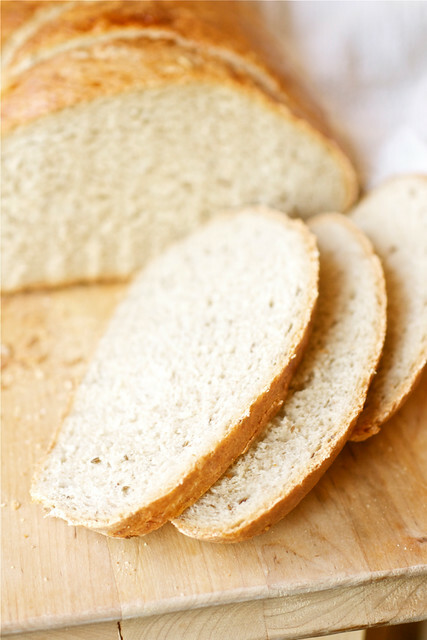 Simply put, the sponge for this recipe is a quick mix of flour, yeast, and honey and allowing it to ferment for at least 2 1/2 hrs (overnight works best) helps to deepen the flavor of the final bread product and it’s a necessary and easy step. This rye bread is perfect! With a soft crumb and sturdy structure, it’s ideal for sandwiches or buttered-up for dipping in soup, or to be served alongside a hearty meal. The caraway seeds make this rye bread everything it was intended to be and if you can’t find them in your regular grocery store, consider ordering them from an online source, like Penzey’s. The recipe yields either one very large loaf or two smaller loaves and considering we have so much leftover, I’ll be slicing up most of the loaf and freezing it for sandwiches down the road…or perhaps for an Irish stew this weekend. Either way, this rye bread is a keeper and I know we’ll be making it for years to come. For the dough: Stir all-purpose flour, 3 1/4 cups rye flour, caraway seeds, oil, and salt into the sponge. With machine fitted with dough hook and set on speed 2, knead dough, adding the remaining 1/4 cup rye flour once the dough becomes cohesive; knead until smooth yet sticky, about 5 minutes. With moistened hands, transfer dough to a well-floured counter, knead it into a smooth ball, then place in a lightly greased bowl. Cover with plastic wrap and let rise at warm room temperature until doubled in size, 1 1/4 to 2 hours. Generously sprinkle cornmeal on a large baking sheet. Turn dough onto a lightly floured work surface and press dough into 12×9-inch rectangle. (For 2 smaller loaves, halve the dough, pressing each portion into a 9×6 1/2-inch rectangle.) With one of the long sides facing you, roll dough into a 12-inch (or 9-inch) log, seam side up. Pinch seam with fingertips to seal. 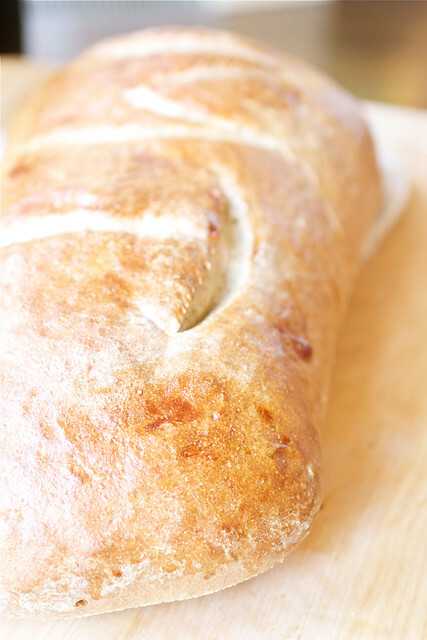 Turn dough seam side down, and with fingertips, seal ends by tucking dough into the loaf. Carefully transfer shaped loaf (or loaves) to prepared baking sheet, cover loosely with greased plastic wrap, and let proof until dough looks bloated and dimply, and starts to spread out, 60 to 75 minutes. Adjust oven rack to lower center position and heat oven to 425 degrees. For the glaze and baking: Whisk egg white and milk together and brush over sides and top of loaf (loaves). Make 6 or 7 slashes, 1/2-inch-deep, on dough top(s) with a serrated knife, single-edge razor blade, or lamé. Bake for 15 minutes, then lower oven temperature to 400 degrees and bake until golden brown and an instant-read thermometer inserted in center of the loaf registers 200 degrees, 15 to 20 minutes for small loaves and 25 to 30 for larger loaf. Transfer to a wire rack and cool to room temperature. Slice and serve. What a yummy looking bread! Awesome. I have never used rye flakes in my rye bread. What do you think they added? Texture or taste? Barbara: The write-up about the recipe in Baking Illustrated notes that rye flakes enhance the rye flavor in the bread. so true about the rye bread… took a while to get it right! I definitely think the sponge is the key. Looks beautiful. Thanks, Melissa! Hope you love it!